What is the Irish Experience? 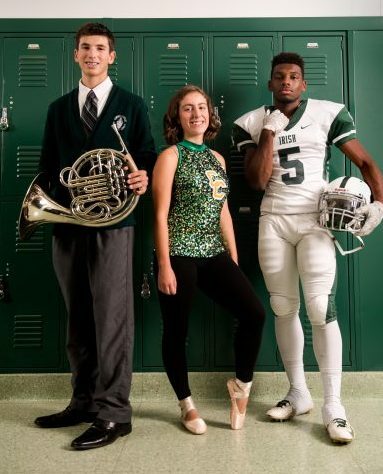 The Irish Experience is a day for you to see a typical school day at Camden Catholic High School in action. You will be hosted by members of Camden Catholic’s Green & White Society. 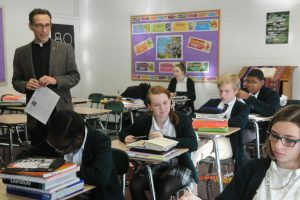 Throughout the day you will get a sense of the academic, spiritual, and community aspects of Camden Catholic. At the end of your experience, you will see all that Camden Catholic has to offer and get a feel for our Irish Pride! Who can be a guest at Camden Catholic? Current eighth grade students and anyone interested in transferring to Camden Catholic may come for a visit. When can I come for a visit? Please see the list of available dates below. Dates fill quickly, so make sure to register early. How does the Irish Experience work? All guests are escorted to the Information Commons by one of our Sophomore Ambassadors. In the IC, you will be introduced to current CCHS students and hear them talk about their experiences at Camden Catholic. From there you will visit 6 class periods throughout the day. Students should wear their school uniform if attending a Catholic school. For public school students, boys should wear Docker-type slacks (no jeans) with a polo or button down shirt, and girls should wear dress slacks or Docker-type slacks (no jeans) or modest length skirt and an appropriate top (no tank tops or shorts). You do not have to bring anything. You will receive your experience packet in the morning with your ID badge, schedule, absent note, and lunch voucher. Jackets and other personal belongings will be stored for you. Please pull into the driveway on Cuthbert and make an immediate right into the Guest Parking Lot. Park in any of the spots that are in the front row facing Cuthbert Blvd. Please walk your child to the Main Office in the front of the school by the flag poles (see photo below) no later than 8:00 am. Once you enter the building you will be greeted by a Camden Catholic student. 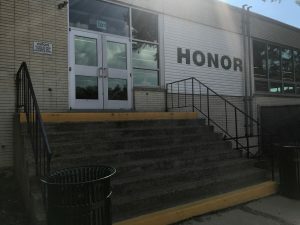 Your day will end at 1:30 pm in our Dining Hall, which is located on the side of the building (the doors where it reads “Honor, Faith, and Loyalty” see photo below). 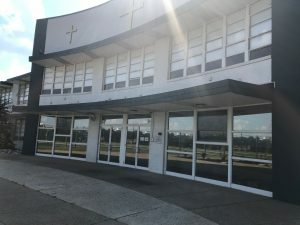 Parents will pickup their students here, where an Admissions Representative will be present to speak with parents and answer any questions you or they may have about Camden Catholic. If your 8th grade student was not able to attend any of the above dates, you may contact Admissions to see if a Guest Day can be scheduled at another time: admissions@camdencatholic.org or 856-663-2247 ext 136.